Summer is almost over and it’s time to go back to school. How about continue enjoying the nice weather and ride your bike to school? 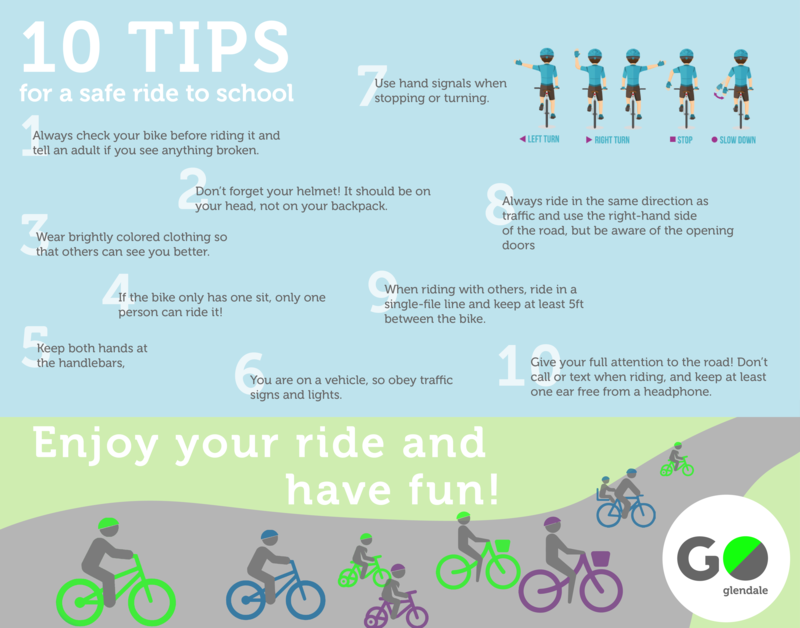 For those who are up to the challenge, Go Glendale put together 10 easy tips to make your ride safer. Check it out below. This is just an easy and fast daily reminder to inform the children about the best practices. But if you are a parent and interested in further information on biking for children, AAA put together a more extensive guide for bike safety for kids. It includes what bike size to choose for your children, how to teach them to ride a bike, safety equipment and when to replace them, and even more. Check AAA guide here and be prepared for the school year. Now that you are all prepared, be sure to use #GoGlendale or tag us on Facebook and Twitter to share your experience with us. Have fun and enjoy a safe ride to school!